Is (or was) Stoicism a religion? I would say no, because there are substantive differences (though there is also overlap) between religions and philosophies, and Stoicism was (and is) primarily a philosophy. It is certainly the case that Stoics can be religious or not — this sort of ecumenicism is one of the main reasons I like Stoicism. It is also true that most if not all the ancient Stoics believed in a god, though they embraced a materialist, pantheistic conception of the divinity, something that moderns can somewhat easily accommodate in the guise of Spinoza’s (sometimes referred to also as Einstein’s) God. But it wasn’t sophisticated philosophical arguments that recently reinforced in my mind the distinction between religion and philosophy. It was, rather, the simple art of traveling and paying attention to what you see around you. I have spent four months during the Spring in Rome, writing my forthcoming book, not at all by chance entitled “How to Be a Stoic” (out for Basic Books in April of ’17 or thereabouts). I also then took a side trip to Turkey, part work, part vacation, and ended up in the middle of a coup d’etat. Two episodes during this period are germane to this discussion: seeing the (alleged) chains that bound Saint Peter in Jerusalem and Rome, and admiring a tooth and hairs from the beard of the Profet Muhammad in Instanbul. Nobody knows whether the chains are really that old, and much less so if they actually held Peter at any time. I’m pretty sure that the miraculous story of how the chains fused together is not true. According to legend, the empress Elia Eudocia (V Century CE) received one set of chains from the patriarch of Jerusalem. She sent them to her daughter, who in turn gave them to Pope Leone Magno. 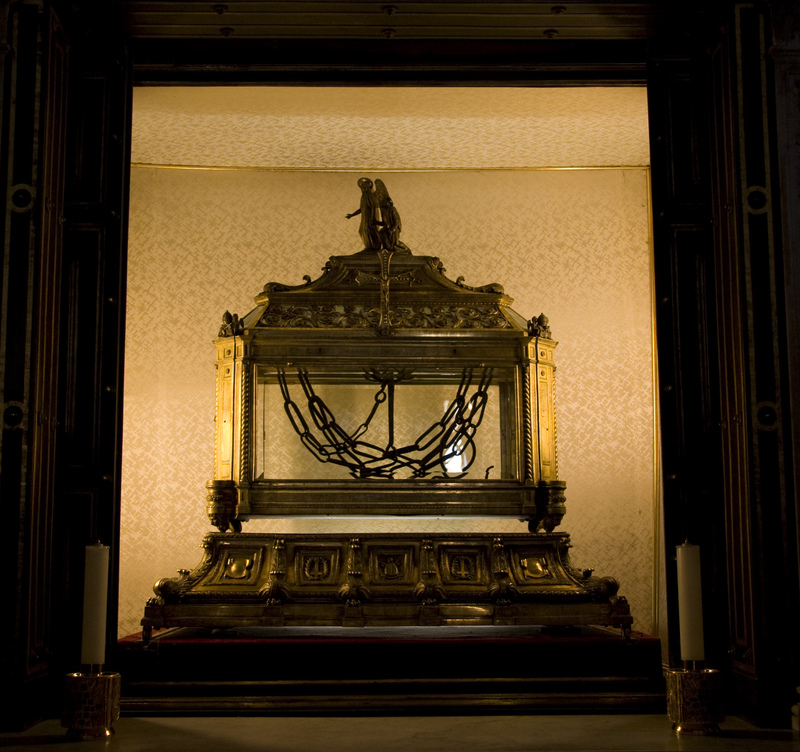 The Pope already had the similar chains that had allegedly held the Saint when in captivity in Rome. When the two sets were brought near each other, they suddenly and miraculously merged into the single chain we see today. 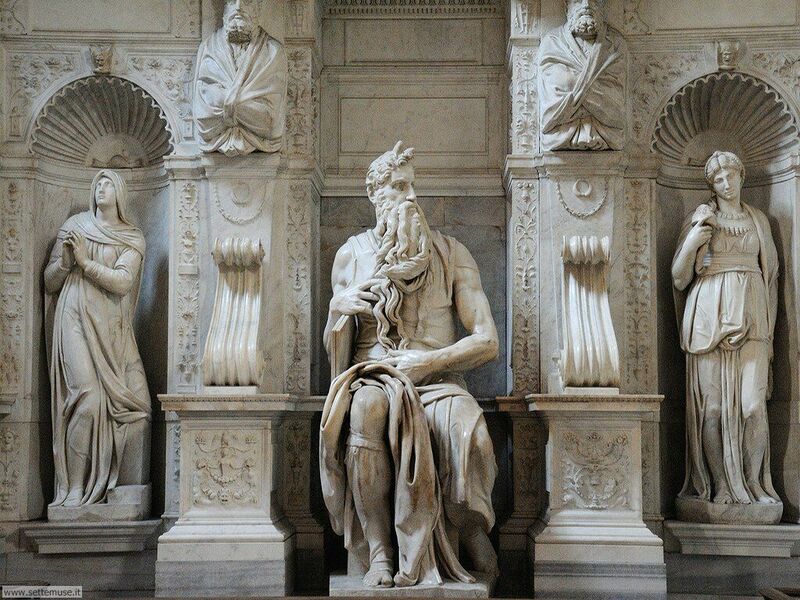 Ever since, pious Christians come to San Pietro in Vincoli to see the chains, which to them certify a supernatural occurrence that reinforces their faith. People (including, during my stay in Rome, yours truly, several times) go to see the statue not because of its religious meaning (Julius was an interesting Pope, but certainly not worthy of eternal worship — he was justly called the “fearsome” and the “warrior” Pope), but in admiration of the immortal art of Michelangelo. So here I was, a non religious person more or less regularly coming to visit the church, not for the reliquary (which I saw once), but for the art. 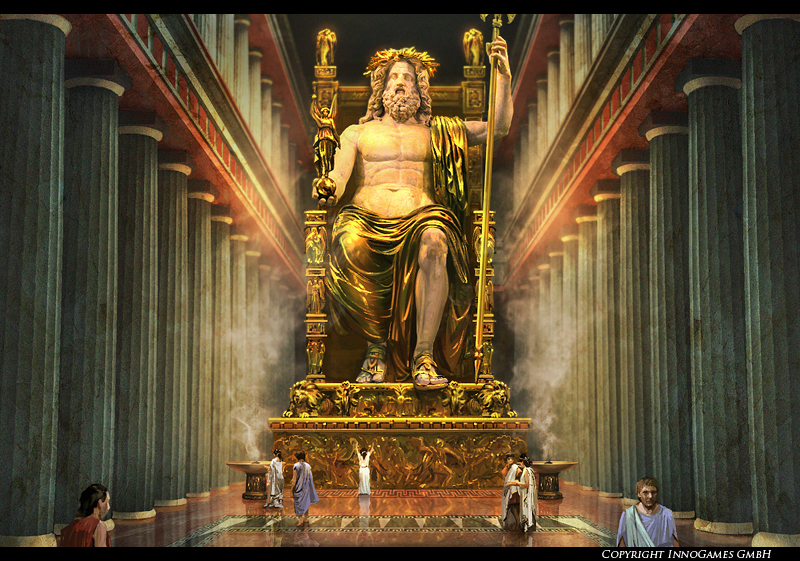 What does that have to do with philosophy, and Stoicism in particular? 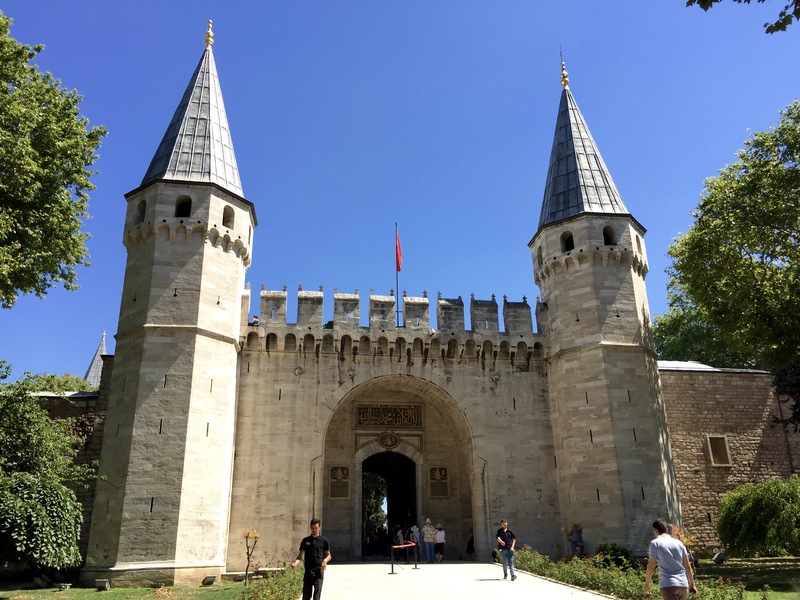 Well, that brings me to the second story: my visit to Topkapi Palace. Inside the palace one finds the Chamber of the Sacred Relics. If you visit it, you will see the cloak of the prophet Muhammad, his sword, one tooth, a hair of his beard, his battle sabres, an autographed letter and other relics that are known as the Sacred Trusts. Quite obviously, lots of people visit the chamber in Topkapi as tourists, like I did, but a good number go there as worshippers of the faith began by Muhammad. Again, compare this to a very different sort of pilgrimage, which I had just done a few days earlier, to modern day Pamukkale, in Turkey. That’s the site of ancient Heirapolis, where Epictetus was born. I walked through the gate of the city (the standing wall is Byzantine, though, not Roman), and visited the splendid theater where Epictetus probably never set foot, since he was a young slave there, before being bought by a better master and moved to Nero’s court in Rome. I did not go to Hierapolis because I worship Epictetus, or because I have developed a religious feeling for Stoicism. I went there out of curiosity for Greco-Roman history, as well as out of reverence for an intellectual giant that has influenced me personally. And that, it struck me, is the most important difference between a religion and a philosophy. Religions, of course, incorporate their own philosophies, meaning that Christianity, or Islam, do present their practitioners with philosophical precepts, both in terms of metaphysics and, of course, in terms of ethics. But the worship of a transcendental entity of some sort is a crucial component, without which we wouldn’t recognize them as religions (which is why, for instance, some versions of Buddhism cannot be labeled as such). 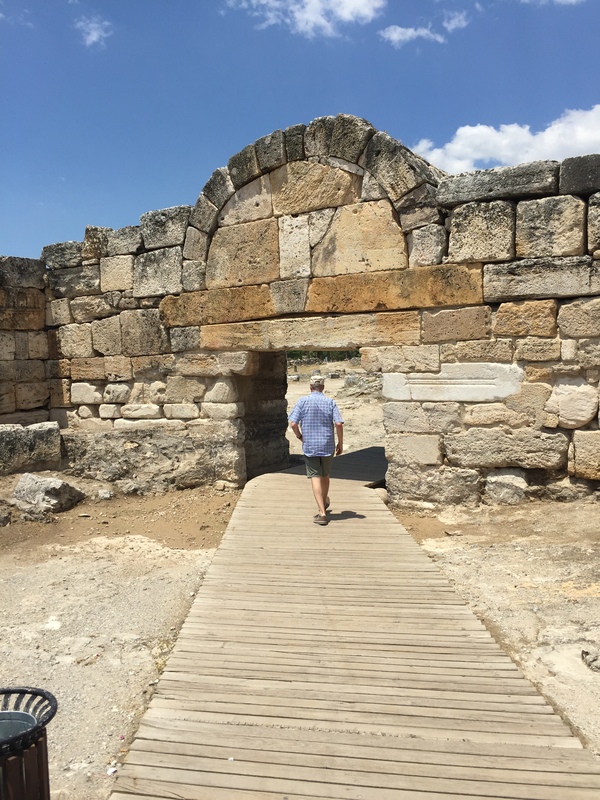 When I visited Hierapolis I was in awe of the ancient site, being mindful that Epictetus walked along those streets when he was young. And I did meditate on several passages of the Discourses during my trip. But I don’t think of Epictetus as anything more than a really interesting man. As much as he was famously proud of his philosopher’s beard (Dis courses I.2), I would think it very odd if someone set up a museum featuring some remaining hairs from that beard. More importantly, I am ready to argue with Epictetus, and Zeno, Chrysippus, Posidonius, Seneca, Marcus, and all the others, because I think they were wrong on this or that. Epictetus leaned too far toward the Cynic spectrum of things, for example, and Seneca’s sexism is downright insufferable, even though it wasn’t at all uncommon at the time. I can do that in good conscience because I am a human being capable of reasoning for myself — and because I don’t think of them as gods to be worshiped. This entry was posted in Other philosophies, Religion on August 11, 2016 by Massimo. The success of your view requires Americans to abolish the First Amendment to the Constitution, or at least to abolish the Establishment Clause. Since that requirement can’t be taken seriously, it’s hard to see how your view about religion and the law can be taken seriously. So far you’ve provided no practical advice for Stoics who have to live with the law as it actually exists. That’s harmful. There are real people fighting real battles on these very points right here and right now; it does not help to tell them that they should wait for the US Constitution to be overthrown. It especially does not help when right-wing Christian groups are using the law to the full effect to advocate their positions and to suppress others. Sorry Eric, but no, my position doesn’t require the abolishment of the First Amendment, it simply requires that the IRS grants similar privileges to educational or charitable organizations that are non-religious in nature, or that it ceases to treat religions as special — which arguably is the thing that actually violates the First. So no, I reject the charge that my advice to Stoics is either impractical or harmful. Indeed, I see the establishment of yet another religion as harmful, or at the very least not particularly useful. But something tells me we will have to agree to disagree on this. The IRS doesn’t decide the relevant issues here. They are (usually) decided by US state or Federal judges (e.g. the IRS had nothing to do with the two cases I mentioned earlier, they were decided in US District Courts). The application of the RFRA is not by the IRS, nor is the application of state RF acts. So, on the legal points, we’ll indeed disagree. I’d encourage you to study the relevant US law. The IRS has ample latitude in extending those benefits to all sorts of organizations, though you are right that a major change in policy would have to come from Congress. None of that, however, has much to do with whether Stoicism has ever been, or should be, a religion. As I said, I strongly disagree with those secular humanists and atheists who want to incorporate as religions. As for the Pastafarians, it was a ridiculous stunt to begin with, I’m glad it ended that way. You’re absolutely right that none of this decides whether Stoicism should be a religion. That’s a debate for another day. As for Pastafarianism, it’s far from over. All religions are based in philosophy but not all philosophy is based in religion. Any structure of ideas and values is a philosophy. Religions encompass more than just a structure of ideas and values. Religions involve social and cultural interactions that are aside from a philosophy. Things like ‘Worship on Sunday in a church’ that’s not a philosophy that’s a cultural practice. All prominent religions have these kinds of rules and practices to separate their followers from the non-followers. Without these practices a religion dissolves over time because everyone just intermingles and finds another religion that’s more appealing to them. If it doesn’t have these rules and practices, it’s really just a philosophy. It’s not going to organize the people on it’s own. Once people start to organize, they form the rules, and a religion is born. You make good points, but I don’t agree with some of them. First off, people can organize around philosophies — that’s what both ancient and modern Stoics are doing, or think of Buddhism, to mention another example. Second, the phrase “just a philosophy” betrays a reductive conception of philosophy, as if religion were actually adding something more. Maybe it is, it is adding a transcendental component. But since I don’t think there is anything transcendental in the world, then religion is adding a negative value, i.e., in a sense it is subtracting from the value of philosophy. To my mind, one of the biggest distinguishers between philosophy and religion is not the tendency to develop customs and rituals; it is their attitude to physics in the stoic use of the word. Religions demand, explicitly or implicitly that you accept their account of physics on faith, possibly with a nod to evidence based practices such as science as a subsidiary source. Philosophy considers physics to be an evidence based process of investigation of natural reality with the acceptance of its’ findings being based on joint and individual evaluation of the outstanding relevant evidence. I roughly share your view, Eric. All this talk of worship and transcendental entities seems rather misleading. Even within the Abrahamic religions the situation is ambiguous. An hadith of the Prophet Mohammed tells us ‘An hours contemplation is worth a year’s worship’. As a religious person I wouldn’t think of worshiping anything. It seems to me that to read Stoicism as a philosophy it would have to have one, and afaik it doesn’t. Well, I think it does, but most people think it doesn’t. Massimo sees it as materialism in which case it has no metaphysical coherence, but this interpretation is not necessary. It seems to me that it would be easy to line up Stoicism with the philosophy of the Upanishads and the same ethics would emerge. If it is your view that religion is naive and un-philosophical and all about the worship of unknown deities and that philosophy is intractable and a matter of opinion then this comment makes sense. But from here it does not compute. For some people religion and philosophy would be same thing, the search for knowledge and truth. I think maybe it is time for us to grow up and stop being so frightened of religion. This fear works against any real engagement, encouraging a naive and superficial view based on outward appearances. Buddhism is a religion in my view and that of my Buddhist friends. This does not mean that it is philosophically unsound or worships anything. . Assuming that there is no transcendental entity is not doing philosophy but pre-judging the issues. Proving it would be doing philosophy. “Worship” is a lose word, “contemplating” may simply mean the same thing, in context. I’m not sure why you think that a materialist philosophy is incoherent. People keep telling me that my view of religion is naive, and yet they tend to be woefully vague about what a deeper view would entail. I don’t see how one can find truth by venerating / worshiping / whatever entities for which there is no reason to think they exist, nor any tangible evidence that they communicate with humans. I’m not frightened by religion, I simply find it an insufficient guide to human problems. Buddhism is a “religion” in a vague sense of the word. Certainly the varieties of Buddhism that have gods qualify, but the original version didn’t, and then there is secular Buddhism, which is most definitely not a religion.